Facebook Comments Growth Tool is an awesome feature that can help you bring lots of Subscribers to your bot right from your FB Fan Page's posts. 1. Select a certain post from the Page you'd like to connect to the widget. 2. Enable "Track first-level comments only" option - it will disable the growth tool for second-level comments (i.e. replies). 3. Choose whether you want the widget's Auto-response message to be delivered immediately or with a delay (up to 60 minutes). 4. Decide if you want the user to leave a certain comment (meaning that other comments will not be recognized) or if you want to exclude certain words (meaning that they will not trigger the Auto-response message also). You can actually leave these last 2 fields empty so any comment under the post can trigger the Auto-response message. 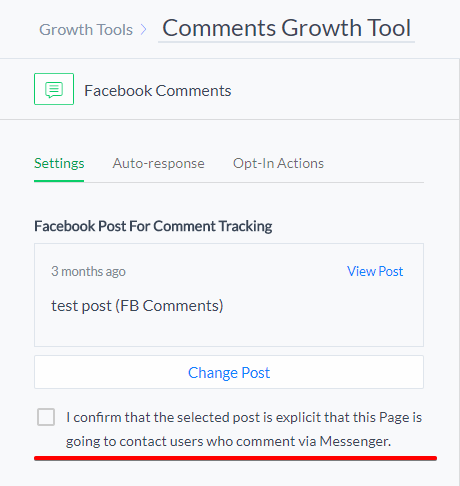 Please note that the Comments Growth Tool works for Published posts on your FB Page, in-progress FB Live posts and Scheduled posts and Boosted posts, but it might not work correctly with Ad posts created in the Ads Manager (for more details, read 'Post Selector' section below, paragraphs 3 and 4). The tool works with new and old posts, but the bot won't recognize already existing comments left in the old posts' comment sections. The widget doesn't work with posts in Groups or on Personal Profiles on FB. Let's talk a bit more about the posts that you can connect to the widget. 'Published Posts' tab includes all posts on your business page - it could be text, photo, video or live video types of posts. Keep in mind that photos and videos should be uploaded to the post from your device - if you add items from the 'Photos' or 'Videos' section of your Fan Page to the post, it might not work as expected with the Comments widget. Only post entities are supported to collect comments and send private Auto-responses to the users eventually. ManyChat doesn't support Event, Offer and Job types of posts, as well as any reposted posts from other pages. So, the safest way to connect Comments widget to a certain post on your Fan Page is to choose it from the 'Published Posts' tab. ManyChat also supports Facebook's scheduled posts - you can choose one from the 'Scheduled Posts' tab and the widget will start collecting comments and sending Auto-response messages to users as soon as the post becomes public. 'Promoted Posts' tab includes Ad posts, Dark Posts, Boosted posts and any other posts that can be promoted on Facebook. Ad posts created in Facebook Ads Manager can be found in this tab. We recommend selecting Ad posts from this list to prevent issues with the invalid post ID. 'Custom' tab allows you to find and connect the post by entering the Facebook post's URL or ID. However, we do not recommend connecting posts to the widget like this (especially Ad posts created in the Ads manager) - ManyChat is not responsible for any errors and issues caused by this method of picking posts. A little bit of an explanation here: this is a mandatory requirement for Facebook Comments Growth Tool to operate (send private messages to commenters) - you shouldn't worry about that, just check the box and you're all set to continue! That's the Auto-response message - users have to interact with it first to become a Subscriber. We suggest asking them some simple yet relevant question which only requires typing a number or a single word. As soon as the user types a reply to the widget's Auto-response message - you've got yourself a new Subscriber. You can choose not to send the Opt-In message at all (please note though that the lack of a confirmation message of some sort might be a bit confusing for some users). You can choose to send the Opt-In message to everyone regardless of the Keywords in the user's response with "Send to everyone who replies" option. Or you can send the Opt-In Message only to those who replied to the Auto-response message with Keywords you've set up in the special field below the option. These Keywords are NOT the same as the ones under Automation section, so they can't be triggered outside this Growth Tool and you can't reuse them for some other Growth Tools in the future. After creating your desired flow, make sure to click 'Publish' button in the upper right corner. You can also subscribe users to Sequences in the widget's "Opt-In Actions" tab now via "Add Subscriber To Sequence" section. While usually the "Opt-In Actions" tab is used to set up the Opt-In Message for users, you may actually choose a different approach. Specifically, you can disable the Opt-In Message in the "Opt-in Actions" tab by choosing "Don't send the opt-in message" option - in this case, you can set up keywords in "Automation" => "Keywords" tab and attach a custom message to them (along with various additional actions). As soon as users type one of these keywords as a reply to the widget's Auto-response message, they become Subscribers and the custom message is triggered right away. Please note that these keywords are global (i.e. work for every reply sent in Messenger). Facebook Comments widget processes 20 comments per minute - this limitation is implemented intentionally so Facebook cannot ban your Page for spamming users. For now, the widget can only be tested once by the same user due to FB's API restrictions - if you've received the Auto-response, that means the tool is working as expected and there's no need for further testing. The widget only works with comments from Personal Facebook profiles - leaving a comment on behalf of your FB Page will not trigger the Auto-response. You won't be able to connect posts from your FB Page to the widget if there are any country/age restrictions set up on your Page. Please remove the restrictions to let the tool work as intended. Please keep in mind that due to technical limitations ManyChat can't track exactly 100% of new subscribers who opt-in via Facebook Comments. All unmatched ones will become subscribers but won’t get an Opt-In Message. Facebook Comments widget only works with comments left under the original post on your Fan Page - shared posts are not supported for now, unfortunately. Hopefully FB allows more options in the foreseeable future! Regarding posts with multiple pictures. 1. Manually by the user in the page's feed: user creates a post, adding all the pics via 'Upload photos/video' or 'Create Photo Album' sections and publishes it. 2. Auto-generated by Facebook when the user creates/updates an album in the Photos section of the Fan Page. -type of post will work with the Comments widget when users leave a comment under the post or in the comment section of the 1st picture in its gallery, but not the other pictures. -type of post will only work with the Comments widget when users leave a comment in the comment section of the 1st picture in the gallery, but not the other pictures. Hopefully this information helps. Go and get the most out of Facebook Comments Growth Tool!